Sheikh Damon El Karim had kidnapped her son Michael and taken him to Kasmara! Cory Brandel was filled with fury at his betrayal -- and shattered by guilt. She'd kept the child a secret from his father when her passionate affair with Damon had ended four years earlier, and now he had sworn revenge. He'd vowed to punish Cory for depriving him of his son, his heir, but could he really mean to imprison her in his palace and refuse to let her see Michael unless she surrendered to him? It was barbaric, savage, unthinkable -- and Cory had no choice but to go. 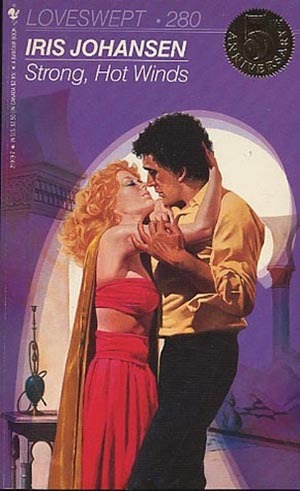 Time had deepened the shocking heat of her attraction to this desert pirate, and Cory knew he had only to stroke her body and she would go up in flames. Damon had intended to bind her to him by force, in anger, but instead he was bewildered by his tenderness and his wild need for her touch. Until now, she'd never understood his loneliness, his pain -- but was she strong enough to give him the enduring love that he needed?